Crispy, flaky and little crunches of salt – perfection. We fell in love with Scallion Pancakes at Mad Mango Cafe in Kelowna, served with an amazing laksa. That’s a little bite of heaven. Ever since, I’ve looked up a few recipes, and never quite had the courage to try making them. Tonight’s menu included a chicken laksa, and just on a whim, decided to give these scallion pancakes a go. I found this recipe on the “Serious Eats” website, and I didn’t change a thing. They were far quicker and easier to make than I thought, and FAR exceeded our expectations. If you have fun playing with dough, make sure to give this a try. Divide dough into four even pieces and roll each into a smooth ball. Working one ball at a time, roll out into a disk roughly 8-inches in diameter on a lightly floured surface. Okay, so my dough ball isn’t exactly a perfect circle, but that’s okay, it will get there. Using a pastry brush, paint a very thin layer of sesame oil over the top of the disk. Roll disk up like a jelly roll, then twist roll into a tight spiral, tucking the end underneath. Flatten gently with your hand, then re-roll into an 8-inch disk. See? What did I tell you, looks like a circle now! Gently flatten with your hand, then start to roll. Paint with another layer or sesame oil, sprinkle with 1/2 cup scallions, and roll up like a jelly roll again. Twist into a spiral, flatten gently, and re-roll into a 7-inch disk. Repeat steps two and three with remaining pancakes. 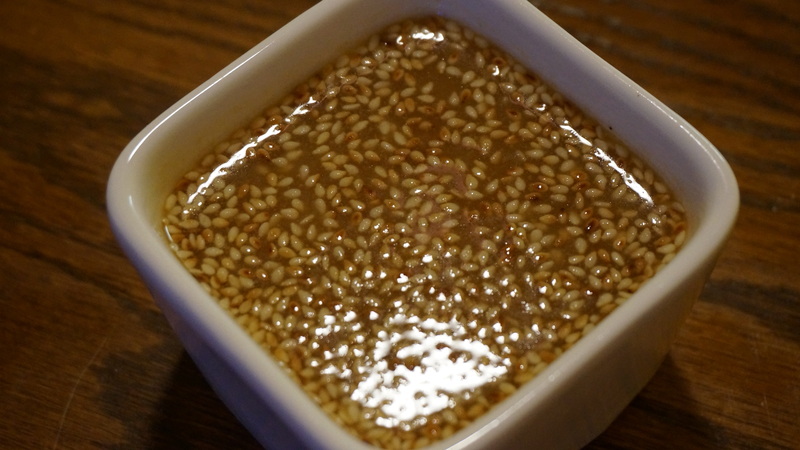 Make sure to brush on just a very delicate layer of sesame oil – if you get too much on there the oil will start to pop out when you roll the dough. Heat oil in an 8-inch nonstick or cast-iron over medium-high heat until shimmering and carefully slip pancake into the hot oil. Cook, shaking the pan gently until first side is an even golden brown, about 2 minutes. As soon as you remove the pancake from the oil, immediately sprinkle with a little sea salt. Carefully flip with a spatula or tongs (be careful not to splash the oil), and continue to cook, shaking pan gently, until second side is even golden brown, about 2 minutes longer. Transfer to a paper towel-lined plate to drain. Season with salt, cut into 6 wedges. Serve immediately with sauce for dipping. Repeat with remaining 3 pancakes. Combine all ingredients, and set aside at room temperature. I’ve been working on this recipe for ages, trying to get the correct balance of flavours and I think this is it – finally nailed it. Every brand of these ingredients will be slightly different. Taste the marinade BEFORE adding raw chicken and make sure it tastes great – adjust as needed. Follow that plan with the sauce also, make sure each component of this dish tastes great before putting it all together. Slightly spicy, slightly sticky and slightly sweet – a winning combination in this quick stir fry. Combine marinade ingredients in bowl, stir in chicken and allow to sit in fridge for an hour. Heat wok over high heat until it starts to smoke, add enough peanut oil to lightly coat bottom – quickly toss in onions, garlic and chile peppers. Stir for 1 minute and add chicken. Toss and stir fry until chicken is slightly opaque, add peanuts and 1 tbsp rice wine. Add reserved sauce, peppers and cook until peppers are cooked through. Stir in large pieces of green onion. 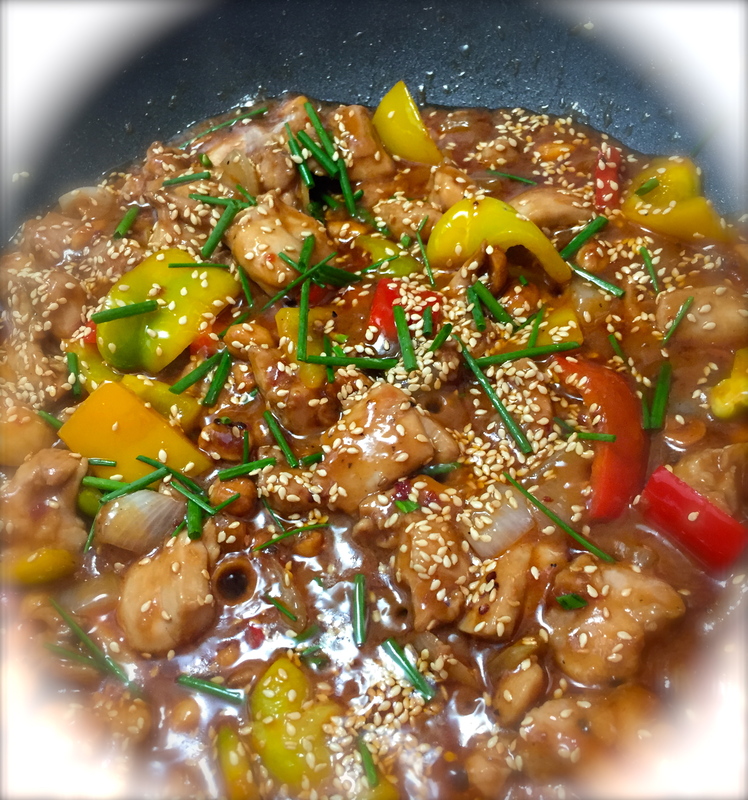 Garnish with the sesame seeds, green onions and red peppers. Serve with sesame jasmine rice, which is super simple! Just toss finely sliced chives into cooked rice along with toasted sesame seeds and a little sesame oil. Cook 1 pound Chinese noodles (chow mein style) – drain and rinse. Blend well, and set aside. Chop up an assortment of your favorite vegetables – about 3-4 cups worth for 1 pound noodles. Toss everything together with the dressing. 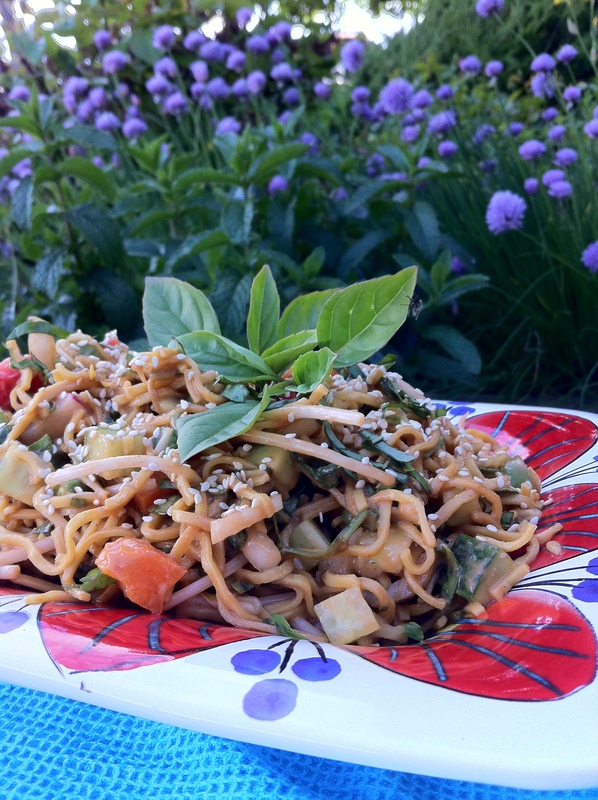 Garnish with toasted sesame seeds, cilantro and fresh basil.